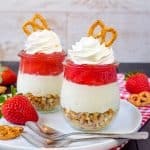 This easy No Bake Strawberry Daiquiri Cheesecake is a refreshing dessert to enjoy on a hot summer day. 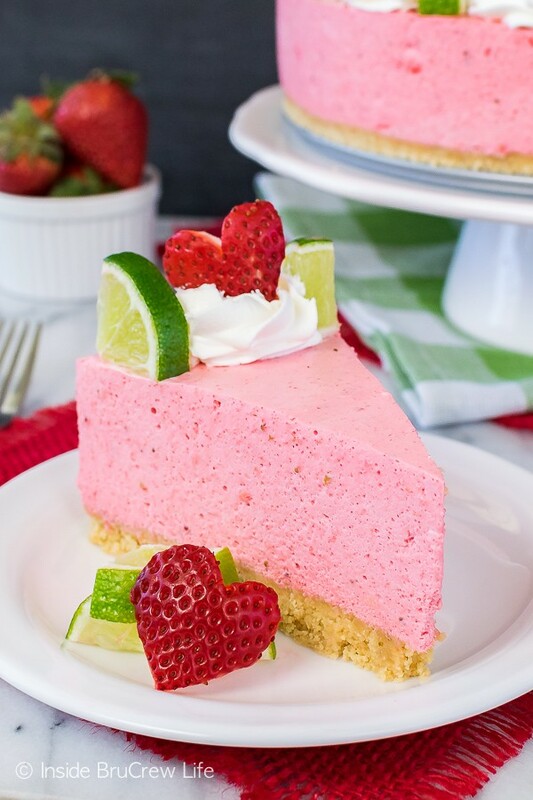 Strawberry and lime pair so well in this light fluffy mousse cake! Oh, my word! High school graduation is one week away! It’s slowly sinking in that our oldest will be officially out of school very, very soon. How in the world is that even possible? I mean, didn’t we just drop him off for his first day of kindergarten like yesterday??? I guess time really does fly when you are having fun. We have done so many things in the past 13 years since his first day in K5. He has moved 5 times with us, been in 3 different schools, played soccer and piano, been involved in church groups, performed and sang in programs, gotten his driver’s license, worked at Walmart, gone on missions trips, and applied for college. All of those things add up to 13 years disappearing in an instant! I feel like an old person saying this, but seriously enjoy every minute of the busy. Before you even know it, those little kiddos will be big almost grown ups. It’s so crazy how that happens. Last week our son asked if I could make him a dessert to take into one of his classes. The last time he asked for a treat for class I made these easy chocolate marshmallow cookies. He said the kids devoured them and asked him to bring more! This time he asked if I could do some sort of cheesecake dessert. He knows that cheesecake is one of my favorite things to make. After all, I did write an entire cookbook about that creamy good stuff! 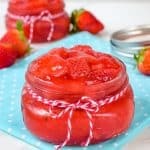 The idea for this no bake strawberry daiquiri dessert has been swirling around inside my head for a while now. This was the perfect opportunity to get to work on it. I had a reason for the dessert, and people to eat it. My jean shorts are always happy when I have other people to taste test my crazy concoctions! 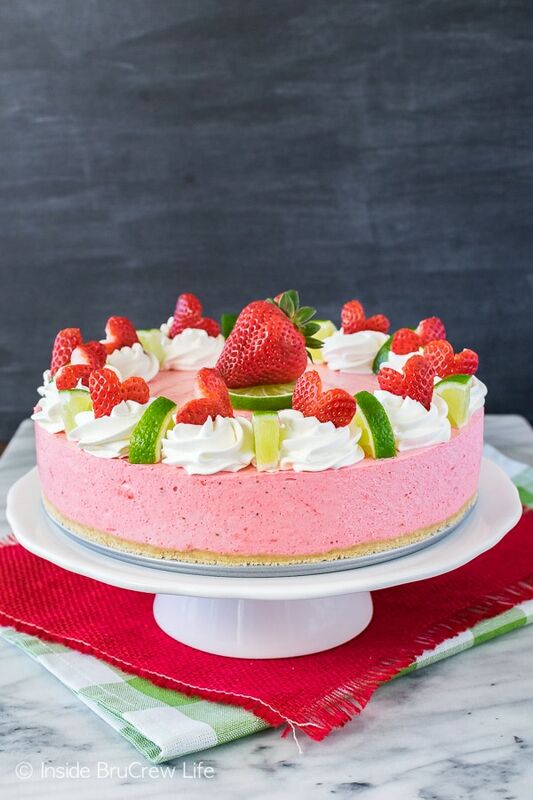 I used this no bake strawberry cheesecake as my inspiration this time. 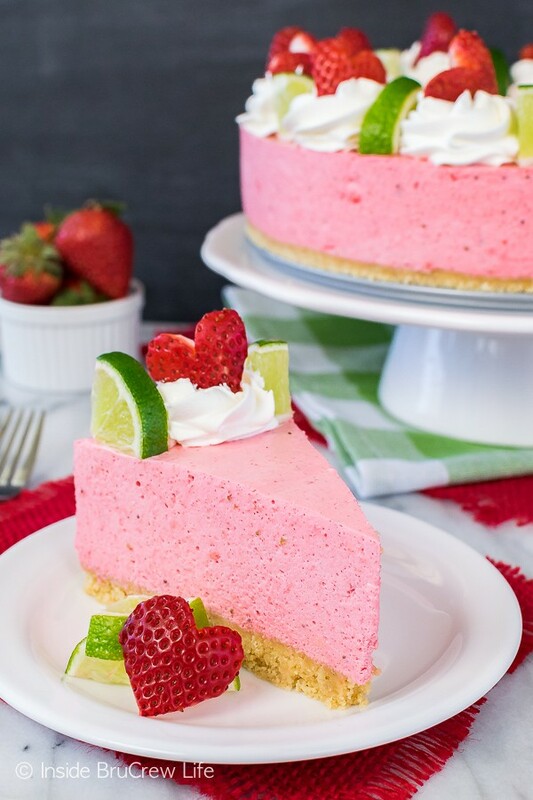 To get the fun strawberry lime flavor in the cheesecake though, I used some strawberry daiquiri mix, fresh strawberries, and some lime zest. You can find the daiquiri mix with the frozen juices at your local grocery stores. It’s basically just strawberry juice with lime added to it. Of course with all that extra liquid going into the cheesecake, I had to find some way to thicken it up. 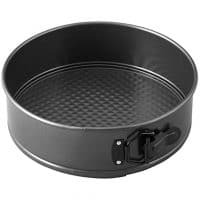 No one wants to open their springform pan and watch the cheesecake ooze right on out, am I right? Dissolving some plain gelatine into the liquid mixture was the perfect way to get that mousse consistency I was going for. 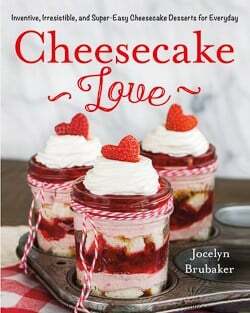 This cheesecake is definitely different from a normal baked cheesecake. It is very creamy, while being light and fluffy. At this point your cheesecake is ready to refrigerate, but…I wanted it to be as bright pink and fun as this strawberry pretzel pie, so I added some red food coloring to get that bright pink color. It’s not necessary, but it sure does make it super pretty. 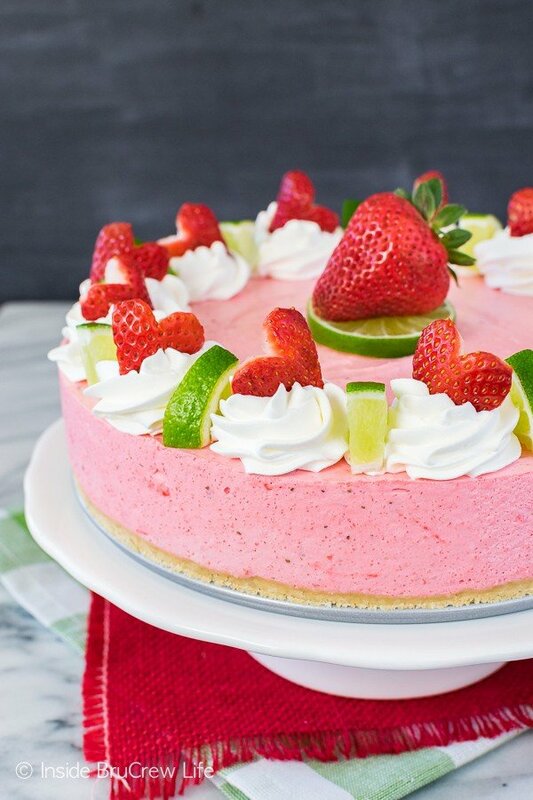 Who doesn’t love a bright pink dessert, right? After mixing everything together, the cheesecake has to have time to set up. We are talking at least four to six hours. 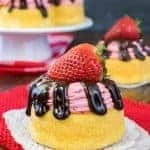 This is definitely a dessert you need to make ahead of time, so plan accordingly if you are making it for a party or picnic. I always make these kind of desserts the night before. Put it all together before you go to bed, then put it in the refrigerator and forget about it. After you take it out of the pan, you can have some fun with decorating the top. 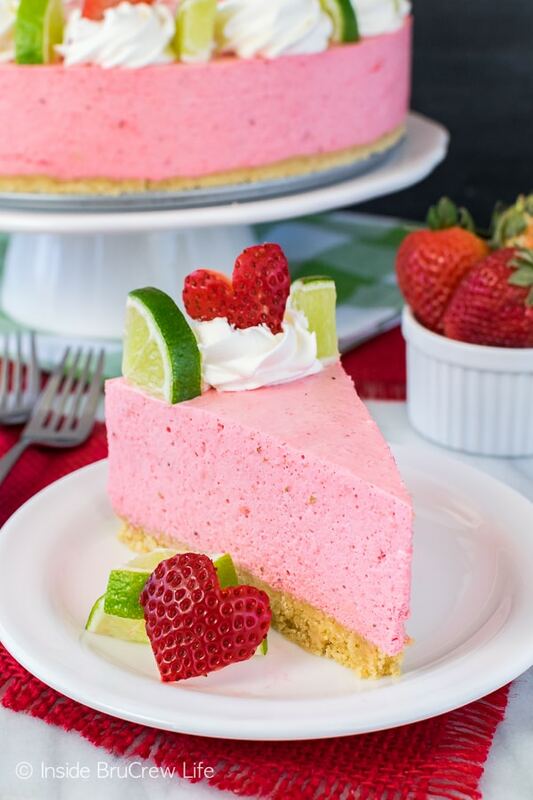 I added some more Cool Whip swirls, strawberry heart slices, and lime wedges. Oh, my word! This is my absolute favorite dessert. For now anyway. Wink, wink! You all know that is subject to change! 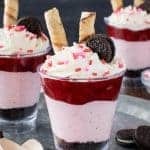 My son said everyone loved this no bake strawberry daiquiri cheesecake. He even took a few extra slices around to some of his other teachers trying to butter them up, so he didn’t have to take finals. If I was a teacher, I would totally take cheesecake over grading another test. But that’s just me. 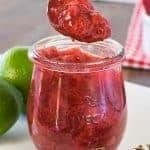 If you are looking for even more fun strawberry desserts, you need to check out this old fashioned strawberry soda. It’s a fun milkshake that is jazzed up with soda and fresh berries! Yum! 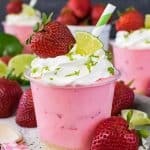 This 5 ingredient frozen strawberry royale dessert looks like the perfect frosty treat for a hot summer day! I love how pretty and layered it is! And of course, a fresh strawberry pie is always welcome to any picnic! I’m loving that glaze and whipped cream on top! Place the cookies (cream included) in a food processor. Pulse until cookies are fine crumbs. Stir the butter into the crumbs. Press the mixture firmly into the bottom of a 9 inch springform pan. Refrigerate. Beat the cream cheese, sugar, yogurt, and extract until light and creamy. Sprinkle the gelatine on top of the strawberry daiquiri mix. Whisk in and let sit for 1 minute. Microwave for 30 seconds and stir until dissolved. 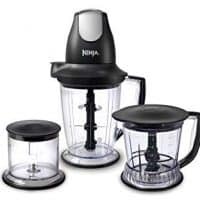 Pour the strawberry mix and strawberries into a food processor and pulse until completely mixed together. Pour the strawberry mixture into the cheesecake mixture and beat until light and fluffy. Fold in 2 cups of Cool Whip and lime zest gently. Add a little bit of red food coloring to boost the color of the cheesecake, if desired. Pour the cheesecake onto the prepared cookie crust. Spread it out evenly and refrigerate for 4-6 hours. Run a warm flat knife around the edge of the pan before loosening the springform ring. 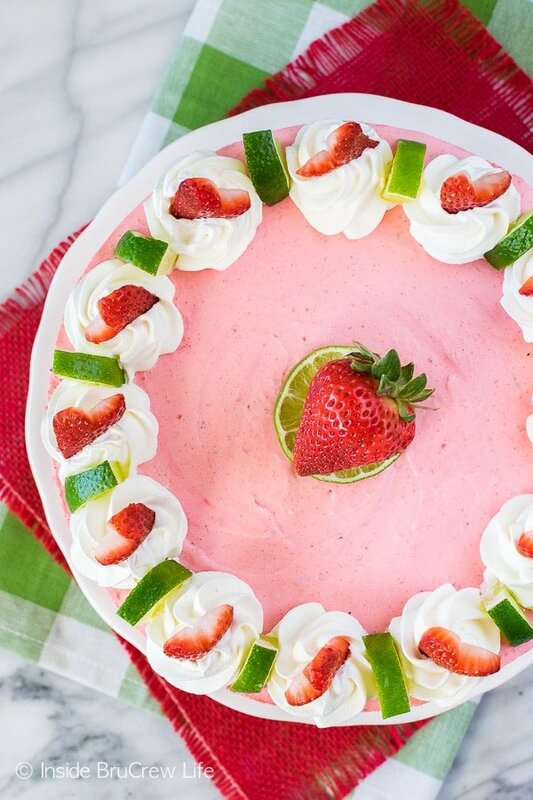 Place on a plate and top with the remaining Cool Whip, strawberry slices, and lime wedges. *This post contains affiliate links. 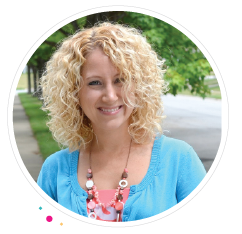 Inside BruCrew Life may receive a very small percentage from sales made through these free referral links. As always, these do not cost you any extra. Thank you for letting us share products we love this way.